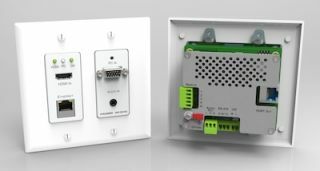 The Kramer WP-5VH2 ultra HD HDBaseT active wall plate auto switcher.Kramer announced today the release of the WP-5VH2 ultra HD HDBaseT active wall plate auto switcher, the first of its kind to offer 4K resolution (ultra HD at a 2K price point) with EDID management, HDMI, VGA, unbalanced stereo audio, HDMI audio embedding and de-embedding, and clock stretching. In spaces where power sources are difficult to reach, the unit can be powered remotely via HDBaseT using a power over ethernet injector (e.g., Kramer PSE-1). The Kramer WP-5VH2 can transmit data to a compatible receiver (e.g., the Kramer TP-588D or Kramer TP-580RXR) up to 328 feet (100 meters) with 4K and up to 590 feet (180 meters) with 1080p60 via a CAT6a twisted pair cable. Many competing HDBaseT solutions cannot support newer video sources that now offer faster Display Data Channel (DDC) rates. The WP-5VH2 overcomes this problem with an integrated solution that enables any source to be connected regardless of its DDC rate. For information about all Kramer products and solutions, including VIA Presentation and Collaboration Solutions, K-Touch cloud-based control solutions, Sierra Video, Minicom Digital Signage, and Kramer Powered by Calibre, please visit: http://www.kramerav.com/.